¶ 2 Leave a comment on paragraph 2 0 Has the digital revolution transformed how we write about the past — or not? Have new technologies changed our essential work-craft as scholars, and the ways in which we think, teach, author, and publish? Does the digital age have broader implications for individual writing processes, or for the historical profession at large? 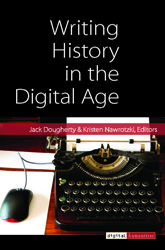 Explore these questions in Writing History in the Digital Age, an open peer-reviewed volume published in open-access online format (for free) and in print (for sale) from the University of Michigan Press, as part of its Digital Humanities Series and the digitalculturebooks imprint. ¶ 28 Leave a comment on paragraph 28 0 Part 6: Public History on Web: If You Build It, Will They Come?